it consumes considerably less energy than a conventional oven. Nevertheless, with at least 1000 sometimes even more than 2000 watts it delivers a respectable performance. For this reason it can be found in many single or small households, but not only there but also more and more often as a “second oven” in normal family households. Because a ready meal, a pizza or a few rolls are in the mini oven much faster and also prepared more energy-efficiently and cheaper than in the “big” oven. The small ovens heat up so quickly that preheating is usually not necessary. The saves time, energy and costs. Another advantage is that it is very flexible. It is not permanently installed, so it can be easily transported when needed and easily used in different places, for example today in the kitchen to bake cookies and tomorrow on the terrace to bake baguettes for the barbecue. Another popular location for a mini oven is the camping site. 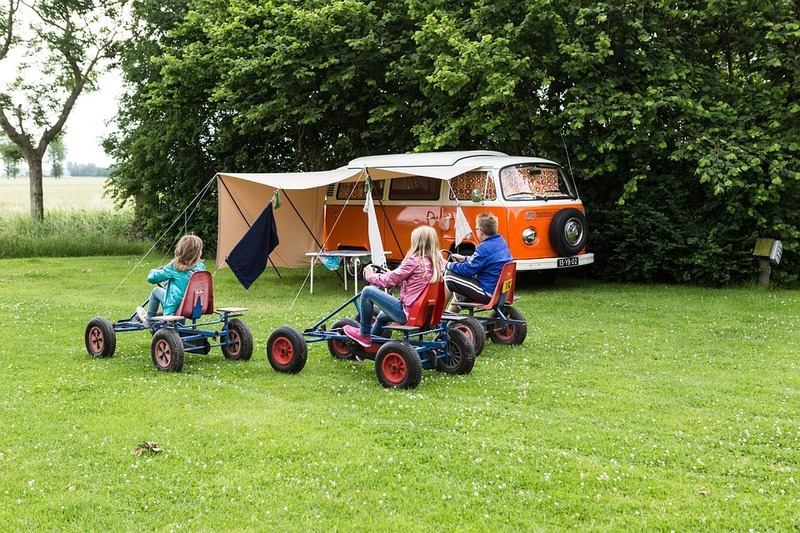 Especially destination and long-term campers do not want to do without comfort and warm rolls or freshly baked pizza in their caravan or motor home. A mini oven does not take up much space, but depending on the appliance it offers a lot of preparation possibilities. A further, but rather rare field of application is in the hobby area. Those who like to experiment with modelling masses or other materials that can be hardened by heat may not necessarily want to use the family oven for this. On the one hand, it is not advisable to prepare food in the same oven in which the vapours of plasticizers or other chemicals have evaporated. On the other hand, it is often not worthwhile to heat the large oven for a few things that you have just made. A cheap second device in the hobby room is a very good alternative here. How does a mini oven work? the food does not touch the walls of the cooking chamber anywhere, otherwise it can easily burn in these places. If the food touches the heating rods, this can even trigger a fire. You should bear this in mind when baking cakes in particular, as they should usually rise nicely, i.e. they will be much higher during baking than you have pushed into the oven. In general, a mini oven is only suitable for the preparation of smaller quantities , depending on its size for about one to two normally sized portions or for about four rolls simultaneously. Many devices have a time switch or a timer that indicate the end of the baking time or even switch the device off automatically. Nevertheless, you should not leave your mini oven completely unattended while it is in operation. For safety reasons, do not prepare food whose cooking time is longer than the timer can be switched on. It is possible that the device is not suitable for a longer operating time and then your mini oven could overheat. For this reason, some devices cannot be switched on again immediately after the maximum operating time has elapsed, but only after they have cooled down completely. The greatest advantages of a mini oven compared to a conventional built-in oven are the smaller space requirement, the great flexibility and the considerably lower energy requirement. A conventional built-in oven must first be preheated for many applications. Depending on the device and the desired heat, this takes 15 to 20 minutes. With a mini oven, preheating can usually be dispensed with completely. If it is necessary in a few exceptional cases, the small cooking chamber will of course heat up much faster than a large oven. Those who only own a very small kitchen often have to limit their choice of electrical appliances and cupboards considerably. This quickly raises the question of whether a large oven is necessary at all and can really be used, or whether an additional cupboard would be more useful and a mini oven would be sufficient for one's own purposes. A mini oven can be connected to any power outlet thanks to a normal power connection. So it is no problem if the kitchen is redecorated or the oven is even used in another room. You can even take him to a party with friends, to the allotment garden colony for the weekend or on a camping holiday in a camper van. A mini oven can also be operated in a shared room. So you don't have to go to the communal kitchen for every small (snack) meal. What types of mini ovens are there? The mini ovens not only differ considerably in their size, but also in their intended use, because there are different variants, such as pure pizza ovens, mini ovens with or without circulating air heat, so-called small kitchens (mini ovens with usually one or two hotplates on the top) and halogen ovens. A special category are the electric salamanders, which are actually intended for professional use, but provide the best results when baking over. The classic mini oven is basically nothing more than a small oven. It bakes with top and/or bottom heat, sometimes also with additional circulating air. You set the desired temperature via a temperature controller and switch on the device. It is usually supplied with a baking tray and a grill. In most cases, a mini oven also has a timer. It is better to set the baking time slightly shorter than stated in the recipe or on the package instructions for your dish and/or keep a close eye on your oven towards the end of the preparation time. This is because a mini oven often requires less time to prepare the same food than a conventional oven or a lower temperature setting. If you do not take this into account, then your noon is quickly burned. A small pizza oven for private domestic use is available in different versions. 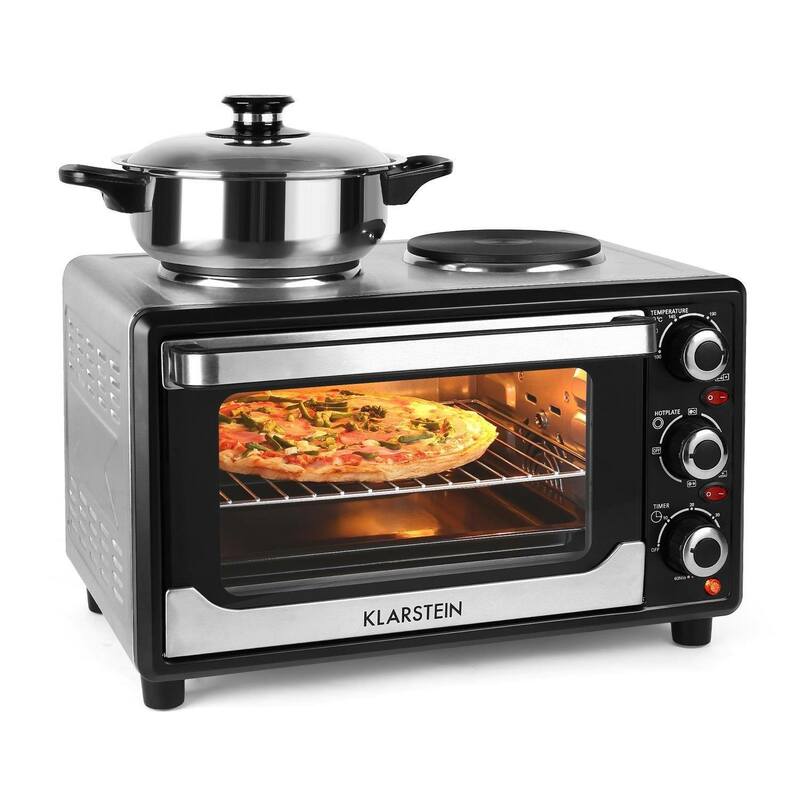 Some resemble a conventional mini oven, but are supplied with a special pizza stone or are adjustable to particularly high temperatures. Other devices impress with their special shape and a dome made of terracotta. Some of these devices can even be put into operation directly at the table. So you can bake pizza together with your friends and eat it at the same time. Depending on the type of pizza oven, the pizza is baked on a stone or in portions in small pans. Pizza ovens usually operate at particularly high temperatures. They can reach up to 400 °C in some cases. The small kitchen is ideal for preparing small menus in the office, in the shared flat or in the allotment garden colony. You can also use the small kitchen on the campsite, especially if you are a permanent camper. The small kitchen does not take up much space in the awning and if you want to make your caravan winterproof, it can easily be stowed inside the car or move into the apartment for this time. In most cases the small kitchen consists of a mini oven and two hotplates located on the top of the mini oven. Here it is important to know whether the hotplates can be switched on and off independently of each other. Sometimes, for safety reasons, both disks may not be in operation at the same time. Read the instruction manual of your device carefully before use. Occasionally a small kitchen has only one hotplate. With the long-wave infrared technology the food in this mini-oven should be cooked particularly gently, quickly and energy-saving. According to the manufacturer, the dishes remain much juicier than those baked using only top and bottom heat or circulating air. Very often these devices are not to be found however so far. This may also be due to the fact that the technology is not known to every buyer and many are critical of it, as is often the case with new technologies. When the microwave was introduced, this was very similar, today the use of this device is known to almost every child. Although it is not available from all manufacturers, it can be found occasionally – the mini oven that can do (almost) everything . In addition to the usual functions, it also offers various semi-automatic and automatic programs that can knead dough or cook jam. This device replaces the kneading machine and the bread baking machine. Thanks to a timer, you can program the start of bread baking at night, for example, and you may even benefit twice over. You use a favourable electricity tariff if your electricity provider has it on offer, and your bread is baked on time for breakfast. This comfort has its price, of course. Such an all-round talent is only worthwhile if the special programmes are used regularly. Then, however, you have the same number of different functions in one device. This saves time, money and above all space in your kitchen. The electric salamander is a mini oven with a strong top heat. It is particularly suitable for gratinating and gratinating dishes. For this purpose it is also used in the professional kitchen or at professional snack stands. You can use it to bake excellent baguettes, for example. While the baguette itself is heated only slightly, the cheese melts very quickly at the top, browning as required. However, a salamander is not suitable for baking frozen rolls or baguettes. By the time the baking part is warm at the bottom, it is already quite black at the top. 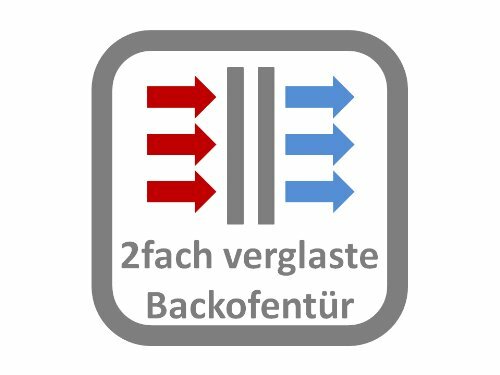 In our Minibaking oven test 2019 we have checked the most important criteria so that the decision for the “right” minibaking oven is easier for you. Most criteria, such as the size, the number of functions or the included accessories are subjective. Decide for yourself whether the price or the design, the brand or the operability or perhaps also the supplied accessories are more important to you. But when it comes to safety and ease of use, you shouldn't cut corners, you should choose the best you can get. The specified dimensions are always the outer dimensions. These are important to know how much space you need to set up the mini oven and whether the appliance you want fits in your kitchen. On both sides and behind the mini oven there should be at least four centimetres of air, upwards even one metre. This enables rapid air exchange during operation and reduces the risk of overheating. Of course, you can push the mini oven into the corner when you are not using it and pull it forward again to work with it. Do not touch the device until it has cooled down completely. During operation, a mini oven usually becomes very warm. The size of the cooking chamber is always specified in liters. This may be a bit confusing for you because it doesn't say anything about the width, depth or height of the interior. Therefore, you should always see this number in combination with the outside dimensions. A very small mini oven has a cooking chamber of about eight litres, in which you can bake just two rolls, but hardly a pizza. This device isn't much bigger than a toaster. A large mini oven can hold up to 42 litres. That's even enough for a casserole or a cake. However, you have to make sure that such a large oven really fits into your kitchen. The higher the performance of a mini oven, the higher the energy consumption. 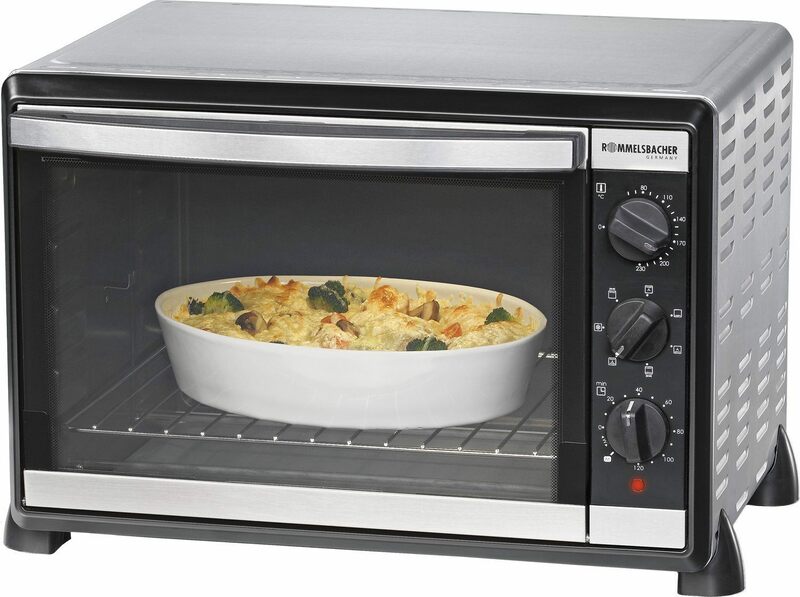 Most mini ovens have an output of around 1000 to 1800 watts, but some also have an output of 2200 watts. Of course, the savings compared to a normal oven are not so big anymore. But there are other reasons for buying a mini oven. Before buying, think about what your new mini oven should really be able to do and adapt the appliance to your wishes and needs. For the occasional baking of rolls or a ready-to-serve pizza you don't need as much power as for baking a cake or grilling a chicken. In principle, each mini oven has upper and lower heat, which can be switched on individually or together. With some stoves you can also switch on circulating air. A separate grill function may set the supplied spit in motion at the same time. This should be easy to insert and remove. Mini ovens with this additional function often cost a little more money. You should only spend this if you will also use the grill function. Some mini ovens also have a switchable microwave function. This enables frozen food to be thawed and food to be cooked more quickly. If you don't have a microwave yet, but are thinking about purchasing one, then a combination unit might be a good alternative for you. What do I have to look out for when buying a mini oven? The most important points to consider when buying a mini oven are the following: space and size of the oven, desired functions and of course the price. You should also consider the aspects of safety and user-friendliness. You may also attach particular importance to the accessories supplied. So you first have to know exactly what you want and what is important about a mini oven. Favourable mini ovens are often available for less than 40 Euro, expensive ones cost many times more. The price depends not only on the size and the different functions but also on the manufacturer. Branded products usually cost slightly more than no-name variants. Each buyer must decide for himself whether they are worth it. However, it is also worth considering that brand manufacturers often offer a wide range of accessories, which are either supplied right away or can be purchased retrospectively or additionally. Is it enough if the oven only offers baking with upper and lower heat, or should it also work with circulating air heat? This way the prepared dishes cook more evenly and also brown more evenly. In addition, circulating air usually requires less heat. This means that you can set the temperature a little lower, which in turn saves energy. To keep food warm, the mini oven must be adjustable to low temperatures of around 80 – 100 °C, which is not possible with every appliance. If, on the other hand, you want to bake pizza, then you need an oven that can bake very hot. Here the minimum is 230 °C, but 250 °C would be better, which is also rarely offered. Only special pizza ovens get really hot. The temperatures here can rise up to about 400 °C – ideal for a professional pizza. The hot the mini oven, the more important good insulation is. On the one hand, the case should not become too hot on the outside, so that nobody burns themselves on it, on the other hand, a tightly closing door makes sense, so that the heat cannot escape there, because this consumes energy unnecessarily and causes unnecessary costs. Both therefore help to save energy and avoid burns. Not all doors of mini ovens close really tight, some even have a wide open slot at the top. Presumably this should serve the ventilation, but this is not energy-saving in any case. If your minibaking oven has a timer, it should not only emit an acoustic or visual signal after the set time has elapsed, but should also switch off the appliance automatically. Otherwise the food in it can become too easily black and undrinkable or even catch fire. Another point is that all control buttons and switches on your mini-oven should be firmly seated and stable. They must not come loose or wobble during normal use, but should also not be jammed or difficult to move. The size of the mini oven is not only decisive for its use but also for where it will be placed. The cooking chamber is measured in litres and is only conditionally dependent on the outside dimensions, because it is hardly visible from the description and photos how thick the case of the mini oven is. Between about eight and 42 liters are the figures for the cooking chamber of the various mini ovens. Here you have to consider exactly what you want or what you need. In a small or flat oven , for example, you cannot bake cakes or prepare large casseroles. The external dimensions of the furnace, on the other hand, play a decisive role for the location. Proper use requires reliable air exchange around the unit during operation to prevent overheating. For this reason, a mini oven must never be used in a cabinet. It should also not stand directly in a corner during operation. Behind the stove and on the sides there must be at least 4 cm of air, upwards even a metre of free space is recommended. Of course, more is always better. 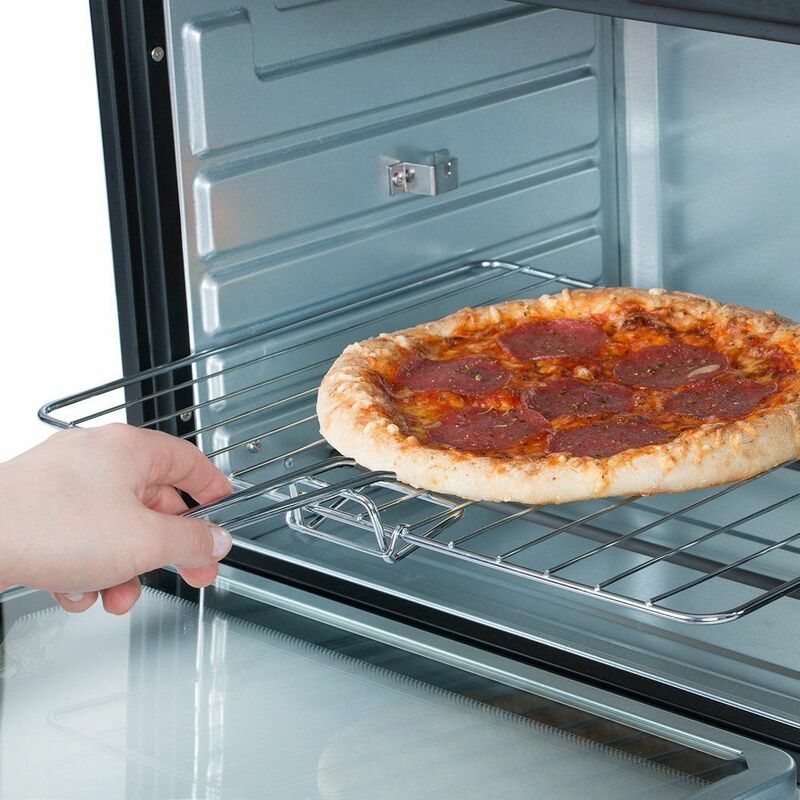 If you only have very little space, then the purchase of a smaller mini oven may make sense. You may also choose an alternative device with limited functions, such as a pure pizza oven or a toast ´n Grill. If there is enough space and you are not yet sure what you want to do with your mini-oven, then in case of doubt you would rather opt for the larger oven. It offers significantly more possibilities and usually also more functions than a small mini oven. You probably won't regret it. A user-friendly device always includes a clearly legible operating manual. The best device won't do any good if you don't know how to get all the nice features up and running and use them. But also make sure that in case of doubt you can operate your mini oven correctly even without instructions. You will not want to read the instructions every time you put your mini oven into operation. Are all buttons and switches clearly labelled? Is it really possible to set the temperature accurately? With some devices, the user almost has to guess where to set exactly the 220 °C that he needs for his dish, since the device is only labelled in 50 °C increments or only lines are present. The interior lighting should be bright enough to allow you to follow the cooking process of your food without having to open the door all the time. Of course, there must also be a viewing window. When you open the door of your mini oven, about 20 percent of the heat it contains is lost. So your stove has a lot to do to make up for this loss. Mini ovens are offered by many manufacturers, as you can see in our Minibaking oven test. Some names are very well known to you as a buyer, others you may have never heard before. Among the offers are German companies of well-known brands as well as no-name products from the Far East. Among the well-known manufacturers are for example the brands Rommelsbacher, Severin, Clatronic, Siemens, Tefal, Steba, Unold and De´Longhi. Here you get some information about different manufacturers of mini ovens. As market leader with Kaffevollautomaten and Espressomaschinen admits, offers De´Longhi a multiplicity of kitchen devices. The Italian company was founded in 1902 and stands for innovation, quality and the best service. It has several production facilities in Italy, but also has production facilities in China. In addition to the world-famous coffee and espresso machines, other kitchen and household appliances as well as heating and air-conditioning devices are manufactured at De´Longhi The mini ovens of this company are quite impressive. They captivate with their unusual design and sophisticated functions. Clatronic is a wholesale company that imports and sells household appliances and consumer electronics under its own name. The devices are mostly manufactured in Asia and belong rather in the lower price segment. They are sold by mail order or through retail outlets (discounters, supermarkets or wholesale markets). In the field of small electrical appliances, it is hard to avoid this company, which has meanwhile earned itself a good reputation. Rommelsbacher is a medium-sized company that is now family-owned in the third generation. It was founded in 1928 by Dipl. Ing. Gustav Rommelsbacher. Today, the company's small electrical appliances are world-famous. A high quality demand on the own assortment in the balance between modernity and tradition is close to the company's heart. Traditional mini ovens in various sizes are produced here, but also very effective mini kitchens – mini ovens with hotplates. “Made in Germany” stands for highest quality. The philosophy of the Sauerland company is to make life as easy as possible for its customers. To this end, Severin's high-quality small appliances with German quality standards and easy handling have been in use for over 60 years. The company is one of the best-known manufacturers of household appliances. For many years, Severin has had its own production plant in China, while the development department and quality assurance are still located in Sundern. With this you can be sure to purchase a good product. Also the company Steba may advertise with “Made in Germany”. In over 96 years she has built up a wide range of products and has a wealth of experience. This can also be seen in the simple and functionally designed mini ovens. Until about 20 years ago, the family business produced exclusively for other brands. Although this branch still exists, Steba now sells its quality products under its own name. Internet vs. specialist shops: Where is the best place to buy my mini oven? There are many ways to buy a mini oven. But first you need to know exactly what you want. Should it be a used device or a new one? Used devices can be found via classified ads in your local newspaper, in special pages or on various pages on the Internet, for example on ebay. Make sure that you get a well-maintained and not too old device. Never buy a used mini oven without taking a close look at it beforehand. Check the power cables and plugs as well. If these are defective, then you prefer to refrain from a planned purchase. It is too dangerous to put such a device into operation. As a rule, new equipment is safer and also more energy-efficient. You can find them in specialist shops or on the Internet. At the dealer you can have a look at the mini oven at your leisure and compare different devices directly with each other. This is indeed a considerable advantage over Internet trading. Unfortunately the offer is very limited with most dealers. Often you get to see hardly more than three or four devices. On the Internet, the range of different mini ovens is almost infinitely large, for many customers almost confusing. In return, you usually get more information on the Internet than from your dealer, because there you will find comparisons and customer opinions, decision aids and product reports about mini ovens. Once you have decided on a device, it will be ordered in a few minutes and delivered directly to your home. The saves you time and the carrying of the goods. and was exceptionally expensive. One kilowatt hour of electricity cost more than a skilled worker earned with one hour of work. The use of electricity was thus reserved for only a small elite. The electric current and thus also the electric stove slowly moved into private households, as did the washing machine, only after the Second World War. However, there was still a long way to go before the mini oven was developed. In the eighties of the last century, the microwave slowly became modern, although its invention had been a long time ago. She could thaw, warm and cook food quickly and with little energy. Sometimes this function was coupled with the baking function. There were both built-in ovens with microwave function and microwaves with baking and/or grilling function. When exactly the first mini oven was for sale in a shop is difficult to find out today. In the beginning it was often bought for small households, for example by singles or for a shared room, perhaps also as additional equipment for the motorhome or the garden house in the allotment garden – just for areas where there was no place for a “normal” large oven or no connection possibility to high voltage current. However, the more attention was paid to the energy consumption of the electrical appliances, the more interesting the mini ovens became for normal households. Those who pay attention to environmental protection and energy efficiency do not want to heat up a huge appliance for two baked rolls or a ready-to-serve pizza. By the time such an oven is hot, the pizza from the mini oven has almost been eaten. Mini ovens are now offered by practically all leading manufacturers of small electrical appliances and can be found in many households. The market is competitive and the offer is constantly changing. Energy efficiency and user-friendliness are just as important in the development of new products as safety aspects and a multitude of functions. each of these inexpensive mini ovens is also suitable for baking pot cakes. Often the cooking space is much too small or there is only one slot for the plate or the grate and the height is not variable. At best, you can bake a flat cake in these appliances. As the price rises, the size and flexibility of mini ovens also increases. In addition to top and bottom heat, circulating air may also be switched on, the quality of the devices and the quantity of accessories supplied increases, as does the number of functions available. A top-of-the-range appliance, which costs more than 200 euros, will even offer you various automatic and semi-automatic programmes for baking bread and making your own delicious jam, as well as a timer which can start the desired programme at almost any time. In between there is such a large variety of different mini ovens that it may be difficult to make a choice, but there should also be the right appliance for every taste. The external dimensions of the individual devices are approximately between 35.5 x 21 x 20 cm and 51.5 x 29.5 x 40.0 cm. They depend on the cooking chamber, but also on the design and insulation of the appliance. When making your selection, however, you should bear in mind that the mini oven can become relatively hot during operation. It must not stand too close to the wall or cupboards, not be covered at the top and not be installed in a cupboard. Nevertheless, the chosen place must be sufficiently large. In most cases, the temperature range for a mini oven is not quite as variable as for another oven. This often means that temperatures below 100 °C cannot be set. However, these temperatures are ideal for keeping food warm or for special cooking methods such as low-temperature cooking. The adjustable maximum temperature is also very important for some dishes or preparation methods. For most mini ovens it is between 200 and 230 °C. If you would like to bake a crispy pizza in your new mini oven, then choose an oven with the highest possible maximum temperature. A mini oven is not particularly difficult to clean and maintain. After use, allow the appliance to cool down so that you do not burn yourself during cleaning. If you have only baked bread rolls, it is sufficient to remove the crumbs carefully. The easiest way to do this is with a removable crumb tray. Remove the tray from the oven and wipe with a damp cloth. Then dry the tray well before putting it back in the oven. You can also easily wipe off grease splashes from the removable crumb tray with some dishcloth and a damp cloth. Also clean the interior walls and the safety glass of your mini-oven regularly, otherwise fat splashes and food leftovers can burn themselves in. Citric acid or baking powder may help against heavily burnt-in stains. However, before using these agents, read the operating instructions for your mini-oven, which the manufacturer recommends in case of heavy soiling. Cleaning the furnace with a steel sponge is not recommended, as the fine steel chips can damage the furnace during operation and in the worst case even cause a short circuit or fire. Can I put the mini oven into operation at home right away? Place your mini oven on a stable, non-slip and fireproof surface at least four centimetres from the wall and adjacent cabinets. If the oven is to be used for a longer period of time, a longer distance is advisable, as the oven becomes relatively hot. There should be at least one meter of air upwards. Before you put the mini oven into operation, you should clean it. Wipe it with a damp cloth. As a rule, it is recommended to heat the empty oven for about 15 minutes at the highest level so that any protective film is burned into the heating elements. This produces unpleasant odours which are also unhealthy and should not be passed on to food. Refer to the instruction manual for your device for what the manufacturer has to say and follow its instructions to avoid damage. How do I find the right mini oven for me? It is a very individual decision to choose a mini oven. First of all, you need to know what is particularly important to you when making your choice, because there is no such thing as the perfect device for every situation. Write on a small list the three or four most important points. What's most important to you? A low price, easy to use, low power consumption, many different functions or a wide range of included accessories? 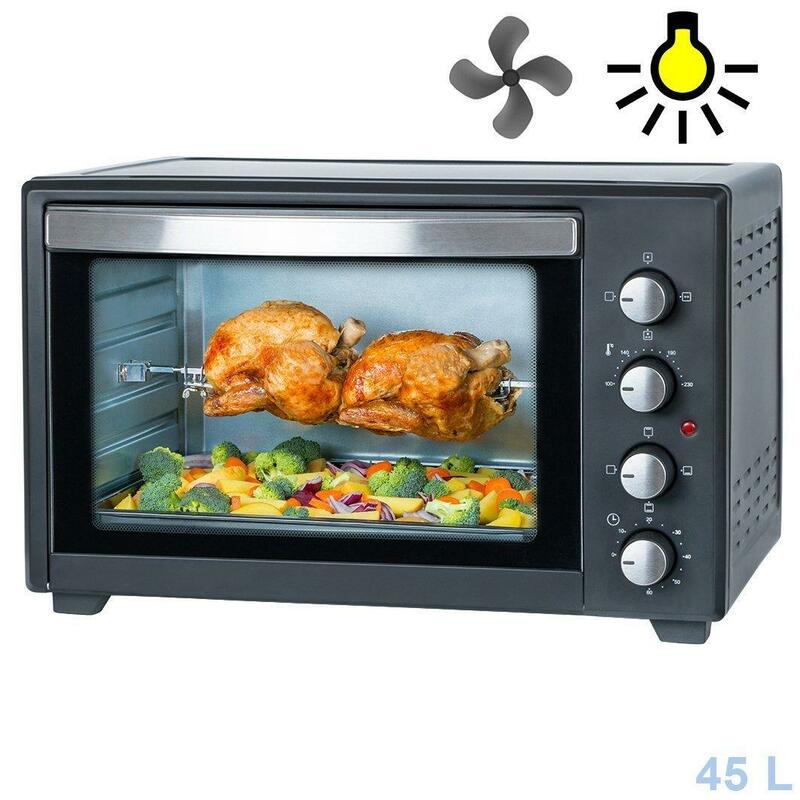 Do you want to use your mini oven to keep food warm, bake pizza or cakes, grill chicken or other things on a spit? You have already decided which size your mini oven may have and in which temperature range it should work. They get particularly beautifully grilled chickens with a grill skewer, which turns independently. Then the chicken turns crisp and brown on all sides. The next step is to look at our range of mini ovens. Which oven can or offers everything you would like to have? Have you found your ideal device? If not, then consider at which points you are most likely to be prepared to cut back. Now there should actually be a mini oven, which comes into question for you. 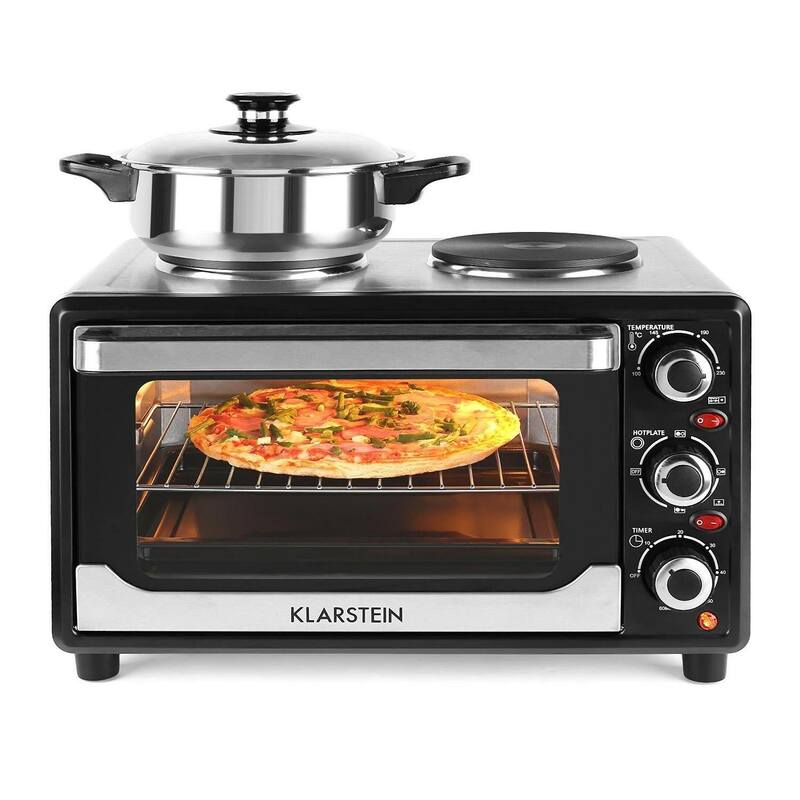 Which mini oven is best suited for my motorhome? In a campervan the available space is usually very limited, but you still want to feel comfortable. There should be everything you need and the motorhome should not look crammed at the same time. It is therefore particularly important that the mini oven is small. After all, it shouldn't get in the way and interfere when it's not being used. Nevertheless, he must be big enough to fulfill all your wishes. Would you also like to eat a good pizza from the refrigerated counter in the evening on your travels? Then the cooking chamber should be large enough to hold a ready-to-serve pizza. In addition, the mini oven must reach a temperature of at least 230 °C, below which a pizza is not crispy but dry. Another important criterion for a mini oven in a motorhome is low power consumption. After all, there is not always a connection to the public power grid available and you want to ensure the fuel consumption of your motorhome. Can I also bake real cakes with the mini oven? In principle you can also bake “real” cakeswith a mini oven, but rather in small format. Normally proportioned baking tins don't usually fit in mini ovens, but there is a wide selection of small tins on the market to make excellent cakes. If you like baking, then choose a slightly larger mini oven, otherwise your copy will only end up being suitable for baking muffins. On the one hand, the moulds should fit into the mini oven, on the other hand, the oven must also reach the optimum baking temperature, otherwise the cake will not cook properly inside or it will take too long to bake. This also affects the taste of the finished cake. Where can I get recipes for the mini oven? You can use normal recipes for the preparation of food in your mini oven . If the portions are too large for your device or your needs, then halve or divide by three the information in the recipe. As a good head calculator, you don't even need a calculator. If you use small baking tins for baking cakes, you can do the same or look for special recipe books in bookstores. There are a lot of books for “small cakes”, “small tin cakes” or similar variations. Take a look around the Internet or in your trusted bookstore. By the way: Create your own recipe booklet or a small order in which you write down your converted recipes. Then you don't have to do the math every time. In the long run this saves a lot of time. What is the power consumption of my mini oven? The exact power consumption depends on the performance of your mini oven. A 2000-watt device naturally requires more energy at full power than a 1500-watt device. But it also heats up faster and possibly reaches a higher maximum heat.
. If, on the other hand, you want to bake a large cake, prepare a Sunday roast or a family portion of lasagna, the ordinary oven is the better choice. In short: small portion – small oven, large quantity – large oven. To keep the energy consumption as low as possible in any case, buy a mini oven with a well closing door and double glazing as well as good insulation. Always keep the door closed during the baking process so that no heat can escape. It costs a lot of energy to compensate for this heat loss. Can I bake a finished pizza in any mini oven? Unfortunately this question must be answered with no, because not every mini oven is big enough for it. The size of the cooking chamber is usually given in litres, so this does not really help you to answer this question. You need precise information about the width and depth of the cooking chamber. If you do not find this in the description, then you must measure it yourself or ask directly. You should estimate at least 26 better 28 cm for a standard pizza, because it should not touch the side walls during baking. A large pizza has a diameter of 30 cm. 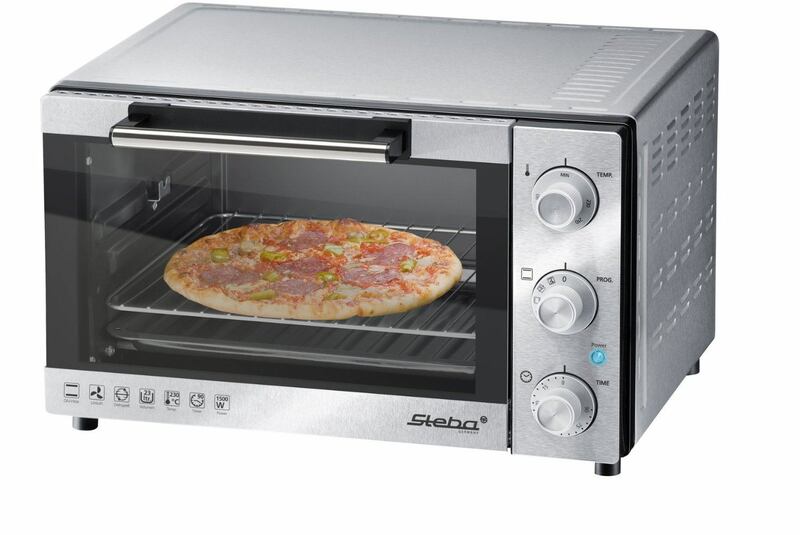 If you often bake pizza, then it is worth purchasing a slightly larger mini oven within a very short time. A bad alternative would be to divide the pizza before baking. If you buy a mini oven, you usually also have need for matching accessories . A baking tray and a grid grid are actually supplied with all devices. If your mini oven also has a grill function, then a grill skewer may also be included, but unfortunately not always. Much more is usually not included in the delivery. If you would like to have additional accessories, then you must buy it additionally. Note, however, that for example trays or grates from other manufacturers may not fit in your mini oven, even if the ovens look very similar. Ideally, you should take a look before you buy to see which accessories you can still buy directly from the manufacturer for your mini-oven at a later date. A pizza stone is rarely supplied free of charge . On it a pizza becomes particularly crispy and gets the typical stone oven taste. If you are a lover of this Italian pastry, then you should think about buying a pizza stone. If you buy a mini oven at a later date, make a note of the internal dimensions of your mini oven and compare these with the dimensions or the diameter of the stone. The greatest probability that the stone will fit into the oven is when both come from the same manufacturer. The thicker the pizza stone, the longer it takes to heat up, but the better the pizza is. If you bake several pizzas one after the other in one baking process on the stone, then the stone should be heated up correctly every time in between. By the way, this is one of the few exceptions in which the mini oven, or in this case the pizza stone, has to be preheated. A removable crumb tray is also very useful. Unfortunately this is not (yet) a standard accessory. It makes cleaning the oven much easier because it is often impossible to prevent crumbs from falling into the oven, for example when baking rolls. These are difficult to remove under the heating loops. If the tray is removable, you can also remove the crumbs immediately. In addition, dripping fat on this tray is much easier to wipe off than directly in the oven. Even the most inexpensive versions of the minibaking oven today often already have a timer. When the set baking time is over, this is indicated by a light signal or a signal tone. In the ideal case, the device switches itself off automatically. However, this feature does not release you from checking when your dish is actually cooked. At least at the beginning, until you know your device well, you should keep an eye on it during operation. This is because a mini oven often takes less time to prepare than stated in the recipe or on the package leaflet of a dish. Usually not supplied, but still a useful accessory for mini ovens, are small baking and oven casseroles in different variants. The usual large shapes often do not fit into the small mini ovens. Be careful not to burn your fingers when taking the hot moulds out of the oven. So the shapes must not be too big. You usually need a little more space to remove it than when placing the cold mould in the cold oven, because you have to keep more distance to the hot inner walls. If, after careful consideration, you have established that a device from our large mini oven test 2019 is out of the question for you, then perhaps one of these alternatives will help you solve your problem and make it easier for you to prepare tasty meals in the future. If you already have a normal built-in oven and are just looking for a way to bake better pizza, then a pizza stone for the large oven might be an alternative for you. On the stone you can bake an excellent stone oven pizza. To do this, heat up the oven and the stone over high heat. Only then do you push your freshly prepared pizza onto the stone. Within a few minutes it is perfectly baked. However, this stone is less suitable for ready-made pizzas, because the heating takes quite a long time. If you want to bake several pizzas one after the other, you should ideally heat the stone up completely every now and then. This is how you get the best baking results. It is not enough, by the way, if you only keep an eye on the thermostat of your oven, place an oven thermometer directly on the stone. Only when this indicates the ideal baking temperature should you put the pizza in the oven. For baking rolls a toaster or a Danish toaster with a large toasting surface is often sufficient. Thus it is also suitable for baking several rolls at the same time or for baguettes. If you only want to bake or gratinate small dishes and prepare toasts, then perhaps a toast ´n Grill is the right choice for you. This appliance combines a toaster with a very small mini oven. Compared to a simple toaster there are no disadvantages, in addition small (mini) pizzas can be baked or the sometimes very popular Bistro-Baguettes. Also the preparation of Back-Camembert or baked fish is possible without problems, but the quantities are very limited, about one large or two small portions you can prepare with this device. If you only value heating food, less baking and browning, then a microwave is also a possible option for you. The space requirement is similar to that of a mini oven. Dishes can be cooked and heated very quickly and energy-saving. The microwave is also often used to warm up food, mainly in multi-person households, when not all people are at home for meals. As a rule, these devices also have a defrost function, which can save a lot of time. Particularly practical are combi ovens that can be used as mini ovens and as microwaves at the same time. A contact grill is ideal if you mainly want to prepare meat or grill vegetables. It heats up quickly and can be stowed away in the cupboard after use to save space. Baking is not possible, but you can expect the best results when barbecuing. In the Halogen or hot-air oven the dishes should be cooked only with light and very energy-saving. However, this new technology is not yet very widespread. Cooking should work quite well, roasting or frying less well.